Win amazing prizes with the BBC 500 Words competition! If you’re between 5 and 13 years old and you like creative writing, you won’t want to miss out on this brilliant opportunity. 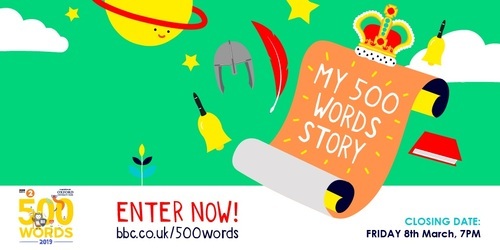 Enter your short story in the BBC 500 Words competition and you could win some awesome prizes! Taking part is simple: all you have to do is write a story – about absolutely ANYTHING you like – using no more than 500 words. Everyone who enters the competition will be entered into a prize draw to party at the 500 Words Final at Windsor Castle, where superstar celebrities will read the winning stories live on the radio and some of the biggest names in pop will perform. This year’s lucky winners will also get to go behind the scenes of a CBBC show AND have their stories brought to life by incredible illustrators including Tony Ross and David Roberts. There are stacks of brilliant books to be won too!